← Chicken Fajitas with a difference! After the success of making stuffed mushrooms recently using leek, tomato and pine nuts, I decided to make a different filling using ingredients I had in the kitchen. These turned our really well with their slightly African taste from the Berbere spice. Peel and finely chop the onion and grate the carrot. 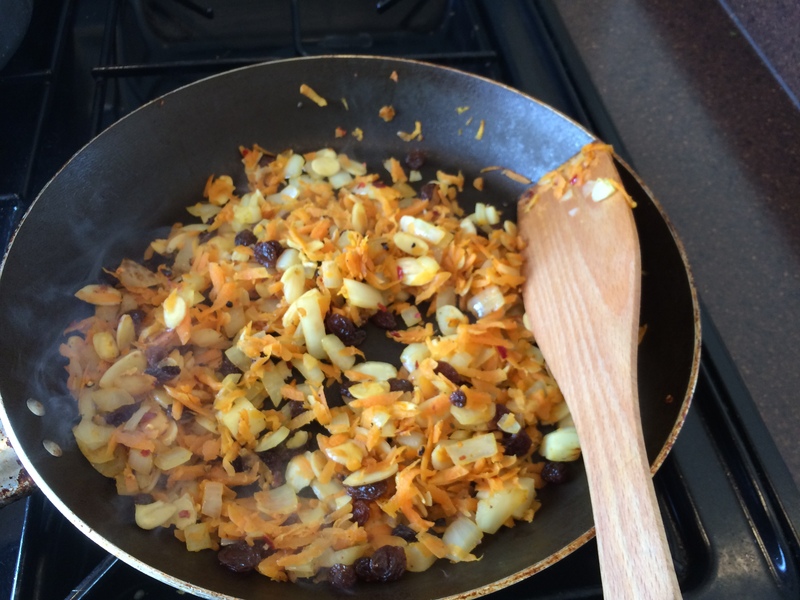 Heat a little oil in a fry pan and gently sauté the onion and carrot for a few minutes before adding the raisins, almonds and spice. Fry gently for a few more minutes to release the wonderful aroma of the spice. Set aside to cool. Remove the stalks from the mushrooms. Heat a little oil in the fry pan and carefully fry the mushrooms for one minute on each side. Remove from pan and place on a baking sheet. Fill with the onion/carrot mixture. Bake for approximately 20 minutes at 160°C. Leave to stand for a minute or two and serve warm. I’ve made this recipe a few times now but each time have been so keen to eat them that I have forgotten to take a photo of the finished mushroom. Believe me, they are delicious and very, very tasty. This entry was posted in Brunch, Dinner, Lunch and tagged Berbere Spice, Carrots, Dinner, flaked almonds, Gluten Free, Healthy Eating, Lunch, Mushrooms, Onions, Raisins, Vegetables, Vegetarian. Bookmark the permalink.